Well, I've got a video here with the good old song of the alphabet. 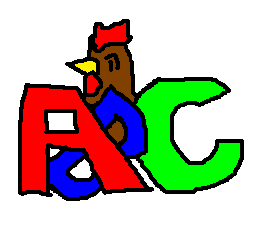 It's all timed up with the Alphabet of Chicken that was recently finished. This is the final stage of that project. Bon Voyage alphabet. Soon this site will set sail toward a new destination, not that I know what that is. Until I know where I'm going all I can do is race blindly forward! :D Glad to put a smile on your face.